Flinker, Noam 2017. Encyclopedia of Renaissance Philosophy. p. 1. Crane, Mary Thomas 2017. The Palgrave Handbook of Early Modern Literature and Science. p. 95. Hamann, Byron Ellsworth 2016. How to chronologize with a hammer, Or, The myth of homogeneous, empty time. HAU: Journal of Ethnographic Theory, Vol. 6, Issue. 1, p. 261. Asprem, Egil 2015. Dis/unity of Knowledge: Models for the Study of Modern Esotericism and Science. Numen, Vol. 62, Issue. 5-6, p. 538. Saif, Liana 2015. The Arabic Influences on Early Modern Occult Philosophy. p. 144. 2011. A Phenomenology of the Apocalypse?. Time & Society, Vol. 20, Issue. 3, p. 406. Forshaw, Peter J. 2011. Conversations with Angels. p. 175. Marshall, Peter 2011. Conversations with Angels. p. 295. Clucas, Stephen 2011. Conversations with Angels. p. 150. Raymond, Joad 2011. Conversations with Angels. p. 317. Mentz, Steve 2010. Strange weather inKing Lear. Shakespeare, Vol. 6, Issue. 2, p. 139. Miles, Chris 2009. Response: A Quick Game of Rho-Sham-Bo with the Four Horsemen of the Apophasis. Rhetoric Society Quarterly, Vol. 39, Issue. 4, p. 387. Henry, John 2008. The Fragmentation of Renaissance Occultism and the Decline of Magic. History of Science, Vol. 46, Issue. 1, p. 1. Roos, Anna Marie 2008. ‘Magic coins’ and ‘magic squares’: the discovery of astrological sigils in the Oldenburg Letters. Notes and Records of the Royal Society, Vol. 62, Issue. 3, p. 271. Pile, Steve 2006. The Strange Case of Western Cities: Occult Globalisations and the Making of Urban Modernity. Urban Studies, Vol. 43, Issue. 2, p. 305. John Dee's angel conversations have been an enigmatic facet of Elizabethan England's most famous natural philosopher's life and work. 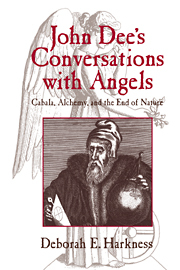 Professor Harkness contextualizes Dee's angel conversations within the natural philosophical, religious and social contexts of his time. She argues that they represent a continuing development of John Dee's earlier concerns and interests. These conversations include discussions of the natural world, the practice of natural philosophy, and the apocalypse.